An entertaining and often funny movie that gets a little too routine and formulaic by it’s end, but is still worthwhile for all the laughs. Wanderlust is a pretty fun movie. I would expect nothing less from Paul Rudd, the filmmakers behind the state TV show, and a whole bunch of movies they made after it. I never saw the state, but I did see each of their movies, from Wet, Hot, American Summer (great), to The Ten (lousy), to Role Models (also great). Wanderlust is in the same category as those other great films. The movie is about a couple that thinks they are on the brink of major success with George (Rudd) thinking he is about to get a major promotion at work, and his wife, Linda (Jennifer Aniston), thinking she might be about to sell a documentary to HBO. The two of them go a buy an apartment in New York City, which really turns out to be a tiny studio, but that is okay, because they make the most of it and our paying a lot to own the place. Unfortunately, their plans do not work out as expected. Linda has a hilarious scene where she tries to show the documentary to the HBO executives and to sell it to them and they could care less. The documentary is pretty depressing stuff about penguins, but the HBO executives are the ones who really steal the scene, kind of like the TV executives who hired Katherine Heigel in knocked up. When Linda jokingly mentions turning the penguins into vampires, the HBO executives’ eyes light up. George also has problems with his work. The company goes under, the FBI comes in and shuts them down, and he finds himself fired. The two of them try to sell their apartment back, but learn quickly that buying an apartment in a lousy economy is a dumb man’s game. Especially when you do not really have money or security. George and Linda now decide to drive away from New York and leave their problems behind them. They end up driving through the woods, in search of a bed and breakfast place. 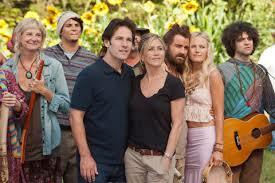 They end up at a camp of hippies known as Elysium. The people at this camp give George and Linda a room and put them up for the night, and it turns out to be a fun night. All of the fun really happens after the two of them fall asleep and then George wakes up to some strange noises and goes down to check them out. After this wild night at the camp, the two of them continue on their way and go to George’s brother’s house. Ken Marino, who has been in all films by these filmmakers, and has never been funnier than he is here, plays this guy. He is absolutely the highlight of the movie, completely stealing every scene he is in, as the jerk brother who has no concept of decency, boundaries, or other people’s feelings. George and Linda leave the brother’s house quickly and head back to Elysium. We are now about half way into the movie, and the rest of the film will really be at the camp. They end up staying there and living there. They make friends with the locals including a nudist winemaker, and hippie shaman (Justin Thereoux), and a wheel chair – bound old man who owns the property (Alan Alda). They start to learn the rules of the place, including free love and letting each other borrow things, such as George’s car. All of this has really been setup and exploration. The setup was what brought the two of them out here, and the exploration has been what they found when they came to Elysium. Most of it is funny. There is an attractive blonde, played by Malin Ackerman, who wants to sleep with George, and then another woman, who is not nearly as attractive, and wants to sleep with him. All of this gets interesting when George and Linda decide that maybe they should act on these impulses, follow the rules of the camp, and sleep with other people. Of course, this leads to problems between them, which sets the movie on a routine path. The characters fight, separate, and then have to get back together. It is the same ending as every other romantic comedy. However, for three quarters of the movie, things were great. Wanderlust works because there is such a talented cast and so many wonderful ideas. Most of the people on screen here are not major Hollywood stars, but they are accomplished actors who have been in a lot and are probably at their funniest in this movie. It also helps that there is just so much going on that if one character or plot idea does not work, than there are many others to take its place. The story might become routine at the end, but that is okay. Eventually this movie was going to have to become something we could relate to. I do like that; George leaves the camp to go to his brother’s place on two separate occasions. It is a great move, because first off, the brother is the funniest character in the film, and secondly, leaving the camp gives us some space and some freshness to the plot. It helps us maintain our interest. Paul Rudd is sexual ad-libs are also a lot of fun here. There is a lot to like about this movie.